A Blue French bulldog is relatively smaller in size and does not have the temperament of a typical bulldog. Blue Frenchie makes a better companion than a protector. The blue French bulldog resembles other French bulldogs in the appearance except for the shade of its fur; the blue one. Well, it is all about genetics.The unique features that they incorporate have made them popular among the mass. Even though the breeder associations do not recognize them, their sale has been exponentially high in some parts of the world. Like other French bulldogs, the one with the blue fur is also referred to as Frenchie. Indoors is where a blue French bulldog enjoys the most. It does not have that soft corner for athletics or any sports and thus loves to be a couch potato. Besides the things that you are aware of about this breed are some interesting facts that you might have never heard or read anywhere. Here is a list of things that you probably did not know about this cute little dog. Although the name suggests a lot most of the times, this is not the case with the blue French bulldog. It came into existence because of the crossbreeding between the English bulldog ancestors and local ratters in France. It was because of the imposition of a ban on the blood sports like bull-baiting. His journey started from a small area in England, Nottingham, as a miniature bulldog from where he was transported to France during the industrial revolution. This is where he finally acquired his name. Unlike typical French bulldogs, they love to relax. They do not even require exercising a lot to stay fit. A little walk every day is just enough for a blue French bulldog to be happy and healthy. But they really love to play with their loved ones, be it humans or other animals. While on the walk, they usually stick to the feet of their owners. It is very rare that they leave their owners at any time. Well, a good thing about this reality is that you do not have to worry about him getting lost. Those who own blue French bulldogs know that they love it when they get the attention. You cannot leave him alone for more than a couple of minutes because he wants your love all the time. They love it when their owners feed them the love and attention. So, you must make sure that you give him some part of your time. Well, they don’t just seek the attention; they give it to you in return as well. Blue Frenchies enjoy licking their owners at many times. The blue French dogs are really affectionate, and they make you understand their presence in your life. The only times they feel sad is when they do not get the love in return. Blue French Bulldogs have a single, very thin, coat of fur. This makes them vulnerable to the diseases. They catch a cold very quickly during the winter season. Well, not just in winters, but the chilled air from your air-conditioner in the summers makes them get into a blanket as well. 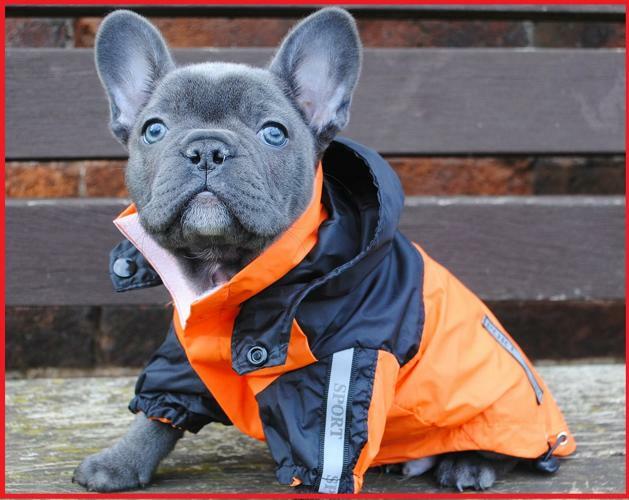 For other dogs, the clothes can be a fashion accessory, but for blue French bulldogs, it is a necessity. Besides the sickness from cold, they are prone to skin and food allergies as well. They sometimes have to follow a specific diet plan to be able to stay away from these allergies. With a blue French bulldog, you will have to see a vet more frequently. You will never regret buying a blue French bulldog once you see the amount of hair on his chair or your jacket. They shed no more than twice a year, which is comparatively lesser than what any other breed does. Although shedding is not a problem as such, having a blue French dog is a more sanitary option. People who own a blue French bulldog know that they are not good when it comes to swimming. Since they have shorter legs than the dogs of many breeds, it is difficult for them to stay in the water. You would need to put a life vest on him when he is around any water-body like, a swimming pool or a beach. Well, a blue Frenchie is quite similar to a regular Frenchie except the coloring, which is a bit different. But for that, you need to spend at least twice as much to get him to your home. The blue variant is relatively difficult to find and thus is more expensive than other variants. But the features that it carries make it worth each penny that you pay for him. Owing to their very flat face, they have labored breathing. This makes their breath process very loud, which can be a problem for you, or perhaps your guests. You need to learn to sleep with those loud sounds if you plan to pet a blue French bulldog. It might bother a lot of people, so keep it in your mind, always. Some of the dog breeder associations do not recognize them because of their blue fur. It is considered that a blue Frenchie is not a pure French bulldog. And this is why your dog will not be able to participate in many dog shows. This is a matter of concern only for those who want their pet to compete. For others, this is not a problem at all. We love to travel and there is a lot to think about when traveling with your pet. The French Bulldog’s short-snout can be problematic in the sky. The French Bulldog has respiratory issues and the stress plus change in temperature can cause a collapse in dogs’ airway. So, if you absolutely must bring your Frenchie on a flight, contact the airline about the best possible way to keep your dog healthy. The Blue French Bulldog is not from a separate breed. It just has a different color of its fur, which makes him (or her) such a rare variant worldwide. The characteristics of a blue Frenchie make it a popular choice for those who want to have a bulldog, but as a pet and not a watchdog. The reasons for him being vulnerable to the diseases and allergies are still unknown, and there’s no evidence that this is because of his blue tone. These are very small dogs, and that makes them prone to a number of allergies. This means that your dog might spend more time than other dogs at the vet being taken care of for allergies. They have many skin allergies, and some dogs are required to eat a very specific diet that will prevent them from having an allergic reaction to what they eat. For example, many different French bulldogs need to have a very low ingredient diet that is made completely of organic ingredients. Because they are prone to skin allergies, it’s common to find these dogs with rashes, puffy eyes and other issues that do require a trip to the vet. Do Dogs Get Jealous? Does Your Bulldog Feel Jealousy? The Best Dog Treadmills for your pup! BulldogGuide.com is a dog owner’s resource for information, tips and advice about Bulldogs, including sections on training, puppies, health, grooming, behavior, news and videos.